Zarnigor Halimova Abdujaborovna is a resident of Rudaki district, the Choryakoron Jamoat, Chavliboy village. She was born on November 21, 1997 in a family of workers. In 2004, she began to study in the local school and graduated in 2015. Since her childhood, Zarnigor was very interested in sewing and therefore after finishing school she got involved in this creative work. She loves her work so much that she herself designs her own dresses. Gradually, Zarnigor has acquired new clients in this sphere and their number increases year after year. She lose efficiency at work because her sewing machine got old. She wanted to buy a new sewing machine, but she did not have enough money for it. Then, she learned from her friend about the lending conditions of MDO "Humo" and applied to this organization. After the analysis, Zarnigor received her first loan in the amount of 3,000 somoni in November 2016. She bought fabrics and other necessary sewing supplies. She sewed many beautiful dresses for sale and increased the profitability of her activity. She is grateful to MDO Humo and the MicroWorld lenders for their financial support. Zarnigor is a very purposeful young lady. 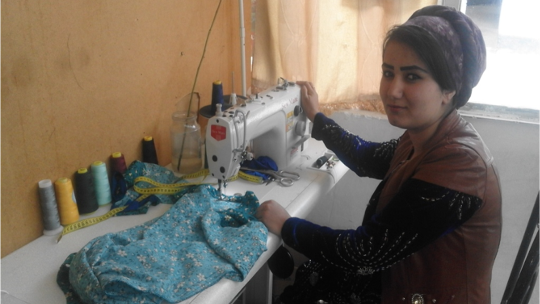 She wants to be more successful in her sewing business and to open her own workshop in the future. If you want to support others projects in Tajikistan click here.